SMRT has announced that it will be implementing shorter operating hours along the entire East-West Line (EWL) on various Fridays and Saturdays this month due to re-signalling and maintenance work. There will be no full-day closures unlike previous months, but it will involve early closures and late openings along the line. Other rail lines will not be affected. In an effort to alleviate the inconvenience to commuters, bus-pooling service ShareTransport will be launching a new ShareTransport City bus service. This new service will see the addition of four new routes, which will bring commuters from town areas like Suntec City, Raffles City, Plaza Singapura, and Clarke Quay. 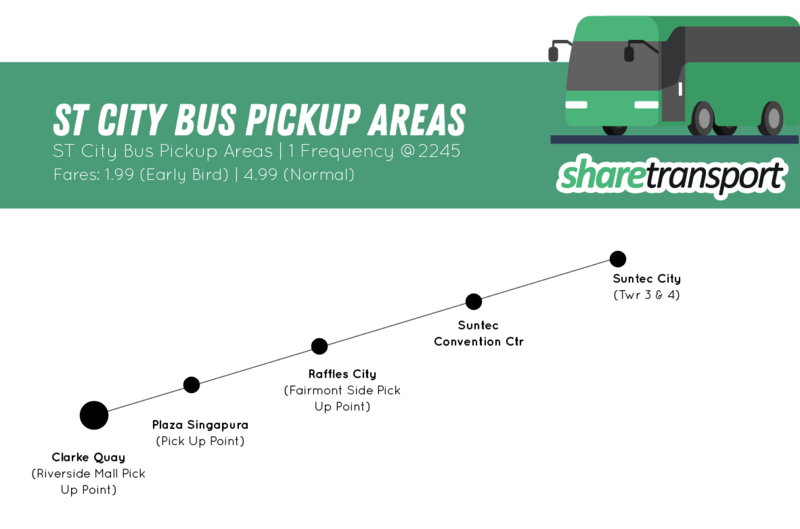 From this month, ShareTransport will deploy 13-seater and 23-seater minibuses on these four routes that will take you to heartland areas such as Bedok, Jurong/Pioneer, Pasir Ris, and Tampines. Mr Pang Kok Leong, managing director of Commute Solutions – the parent company of ShareTransport – said these routes aim to provide commuters “a direct mode of transport” home. Users will be able to plan ahead and make an early-bird purchase via the ShareTransport mobile app (under the Events tab) before 1st March at the rate of $1.99. Thereafter, the normal rate of $4.99 will prevail. The regular fee is comparable to other bus-pooling services such as GrabShuttle; and commuters will basically get to enjoy the same perks such as guaranteed seating, so you no longer have to jostle with the rush hour crowd. It is also an express service so you can get home much faster with fewer stops. With such convenience, it’s definitely a cheaper alternative than riding a Grab or Uber home – so do hurry and take advantage of this promotional price!